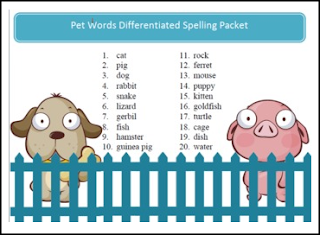 Pets List spelling packet using 10 words with 28 different activities, over 50 pages of printable fun and learning :o); great for differentiated learning. Choose one activity or many for your students to practice the given words. Teachers and students love the independence that comes with repetition of each activity - these activities can be used for word work, independent work, group instructions, morning work, spelling centers, literacy centers and/or homework as well as to supplement your existing curriculum as an intervention strategy. This is a great NO-PREP, fun, interactive and engaging word work bundle of printable activities. Short story story map, graphic organizer, comprehension aid for Common Core. Writing paper with secondary lines,illustration, graph section - 35 styles! Get a customized packet with any words you need in 48 hours! SpellingPackets.com Factory - Spelling packets made super easy!